After arriving back in New York City, I only had a few days before I was setting off in another direction to visit another city, this time even another country. I had to visit the Brazilian Consulate to pick up my passport – I had felt very naked being in a foreign country without it, but I hadn’t really had much of a choice – and sure enough my brand new Brazilian was now affixed to one of the previously pages. On long flights or train journeys I often amused myself by flipping through the pages, counting the various stamps and visas that I had accumulated over the course of the year, and even some from previous years, remembering all the places I’d been to and the stories and memories that went with them. But my Brazilian visa would have to wait, because I had another international trip planned before I boarded that plane to São Paulo. Next stop was to the northern border and onwards to Canada! But I did have a few days in New York to chill out with Melissa for a little while, do my laundry and prepare myself for the next trip, and explore a little more of the city. Melissa ended up having a family emergency that took her back to New Jersey for most of the time I was around, so I set out alone one afternoon to discover a huge street festival that was celebrating the Feast of San Gennaro, a religious commemoration to the Patron Saint of Naples that has evolved into what is essentially a huge Italian food festival in Little Italy in southern Manhattan, and a celebration of and for all the Italian-American immigrants. 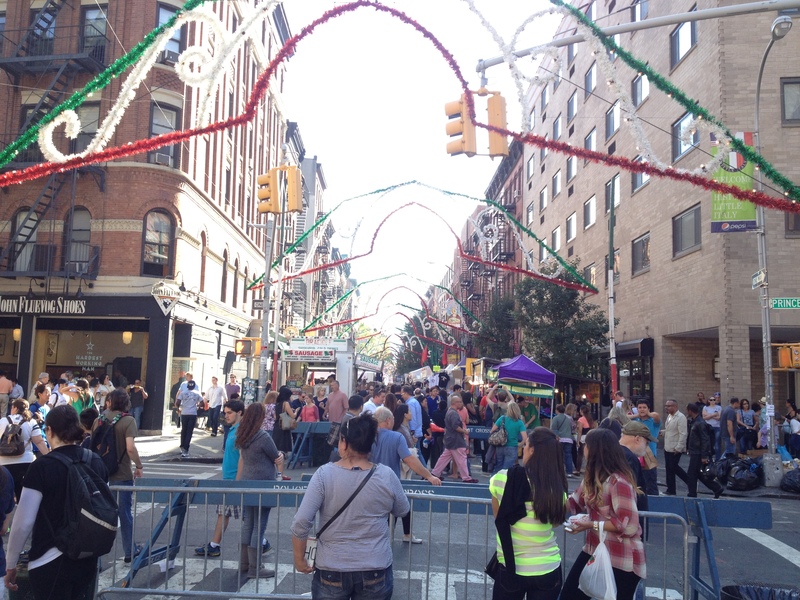 There were street vendors congregated for miles along Mulberry Street selling all kinds of food, mostly of the Italian cuisine like pasta, lasagne and sausages, as well as drinks like coffee, sodas, beers, wine and cocktails, and other stores offering souvenirs, trinkets and games. The festival stretched on seemingly forever, and in the end I stopped and grabbed some lasagne as I walked through the scores of other tourists that had flooded the street. My only regret is that I didn’t have a bigger stomach, and a bigger budget, to try all of the amazing food that I saw and smelt. 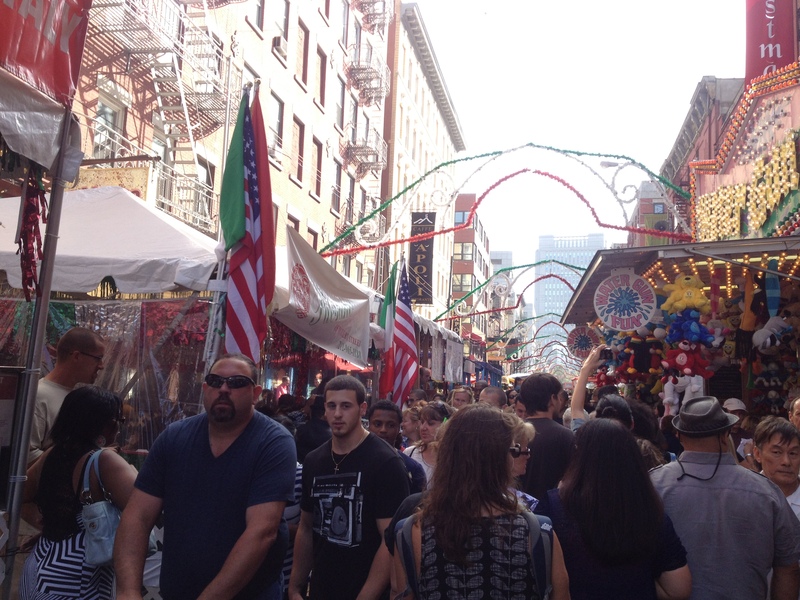 Tourists flooded the street festival for San Gennaro. The festival stretches on for dozens of blocks, with road closures so it could open up into one huge event. Only a few days later it was time to head to Penn Station on the east side of Manhattan, where a train would be taking me north to Canada. By this stage of my time in New York I was having friendly conversations with all the doormen in Melissa’s building, since I had got to know them all so well with my frequent coming and going during the last month – except for one of them, who still gave me a sinister look and asked “May I help you?” every time I passed him, despite it being quite obvious I’d been crashing there for the past few weeks. Thankfully, the only interrogations I would be subject to for the next ten days would be border crossings between the United States and Canada. I had decided to get a train because it was a cheaper than flying, it was less stressful to get to the train station than it was to get to the airport, and because if I was perfectly honest, I was beginning to miss the sensation of good old fashioned train journey through the countryside – one of the things I’ll always treasure about my journey around Europe. Granted, at almost 11 hours it was the longest single train trip I’d made so far – with the exception of the Trans-Siberian, of course, and perhaps the overnight train from Paris to Barcelona – but it was made better by a substantially more comfortable seat and a fully functional dining car with a range of greasy foods that were probably overpriced for what they were but tasted so satisfying that I didn’t really care. I watched the countryside of upstate New York fly by through the window, and I passed the time writing my blog and reading my book. The woman in the seat next to me didn’t appear to speak much English, or if she did she – as I would soon learn most French-Canadians do – chose to pretend she didn’t, so I didn’t have much in the way of conversation. 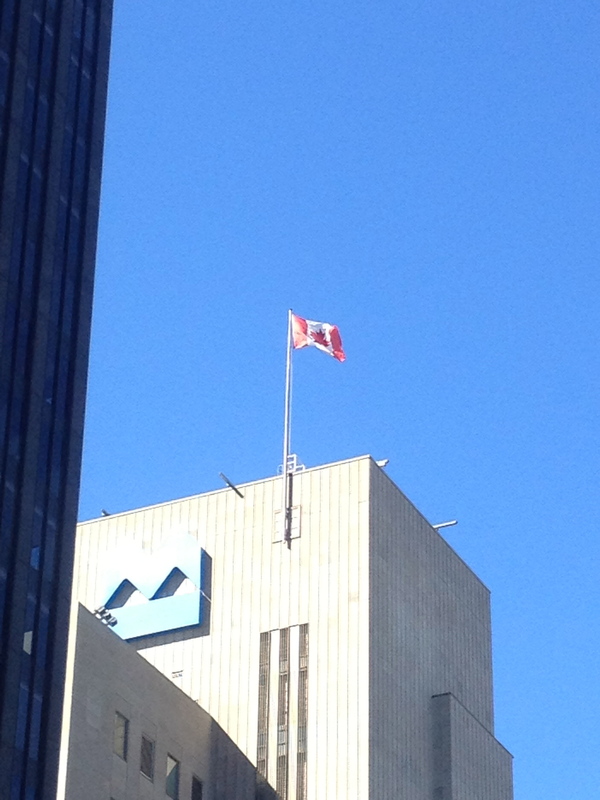 The Canadian flag flying high in Montreal. The border guards were stern but still friendly. When they flipped through my passport and saw the array of stamps and visas, it was clear that I was a seasoned traveller and they didn’t second guess any of my assertions I was just meeting friends in Canada. We had left Penn Station a little after 8 o’clock that morning, but the sun was already setting on the city of Montreal by the time I disembarked from the train and made it out into the street. When I went to an ATM to withdraw some Canadian dollars, I was reminded that I was no longer in an English speaking country – or at least, a non-English speaking province of the country. There was some English, but all the signs and notices were primarily in French. It threw me off a little, after recently spending so much time in the UK and US, but I recognised enough of the words from my time in Paris, as well as through basic linguistic knowledge, to navigate my way through the metro and to the hostel I was staying at that evening, and where I was due to meet my friend Stuart. 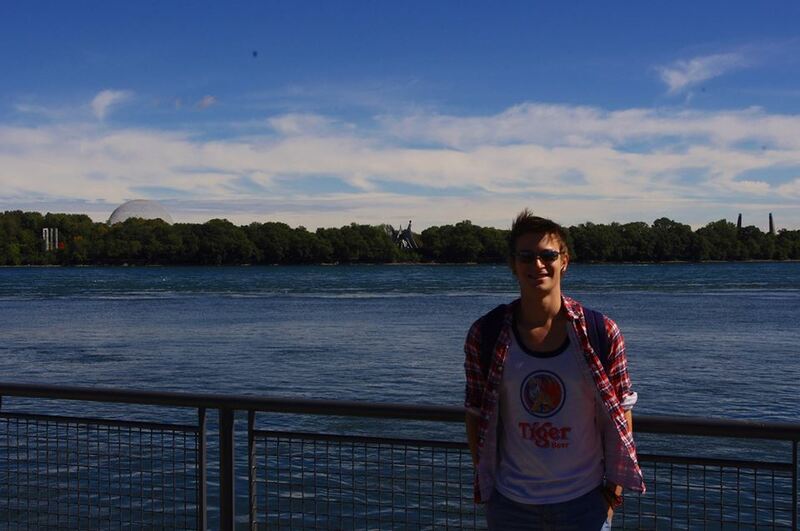 I had met Stuart several years ago when we had both been studying in Sydney, where Stuart was an international student rather than an exchange student, so we’d had several years of classes together instead of just one semester. He moved back home to Calgary, on the other side of Canada, but agreed that he could take a holiday himself and meet me in Montreal. After arriving into Montreal relatively late, Stuart and I went out to have a quick dinner and then spent the evening in our hostel, catching up between ourselves and chatting with some of the other people in our hostel. Originally we had planned to stay with Stuart’s cousin in Montreal, but when those plans fell through we’d had to make some hostel reservations. It was kind of nice, to be honest, to jump back into the hostel culture after spending so long staying with friends and Couchsurfing – if you don’t count the brief stint in Ireland (I don’t, really, considering how little time I spent and how few nights I slept actually there), I hadn’t properly staying in a hostel since I was in Madrid! Although the place we stayed at was more of a house that had been converted into a hostel by putting a large number of bunk beds in a few of the rooms. It was a little bit chaotic, and a few of the people seemed like they had been living there for months from the way they had settled in, but on the whole we were surrounded by other friendly travellers. On our first morning we decided to get most of our sightseeing out of the way, although to be honest there aren’t a great deal of iconic tourist attractions in Montreal. Nevertheless, Stuart had a list of buildings that his mother had written him of places that we should see, so we went off into the crisp morning air and flawless sunshine to check off the sightseeing list. 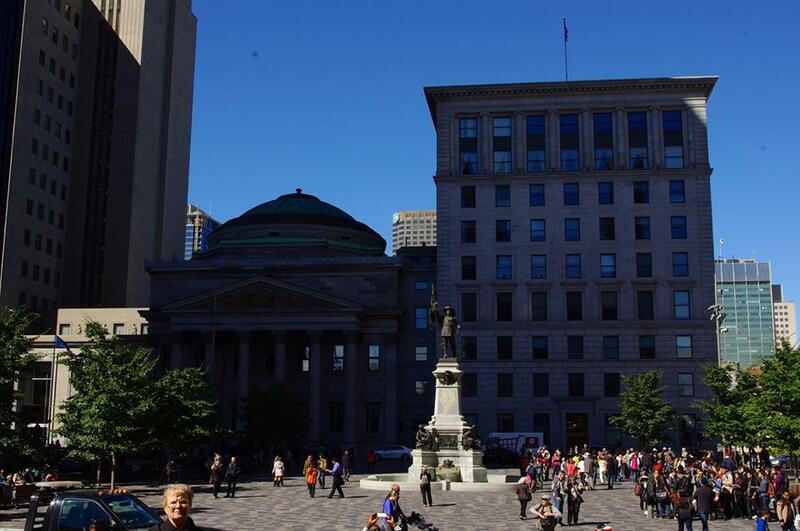 The French influence on the province of Quebec and particularly Montreal were noticeable in highlights such as their own Notre Dame Basilica, as well as all the streets being named in French. 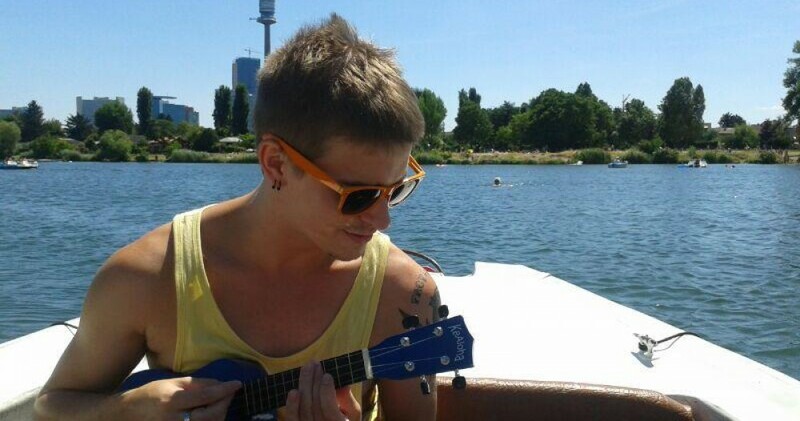 It was a little like being back in Paris, except… not. 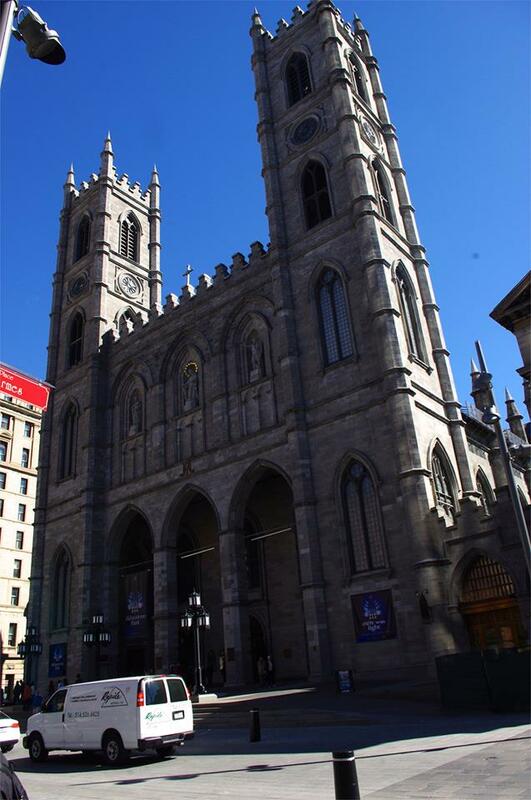 The Notre Dame Basilica of Montreal. 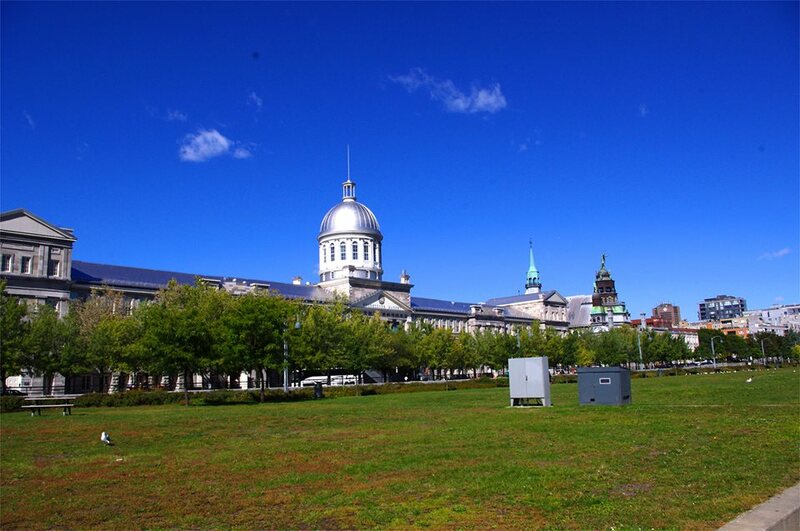 The silver dome of the Bonsecours Market. Monument à Maisonneuve, in the middle of Place d’Armes, just across from the Basilica. 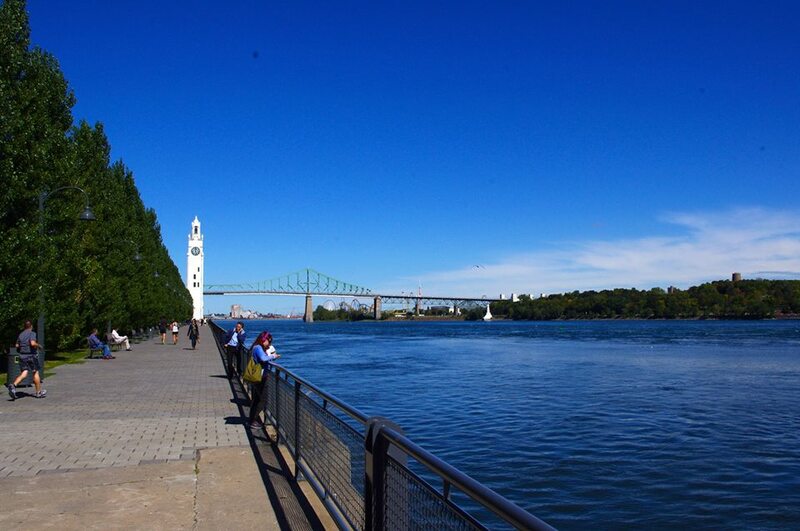 Jacques-Cartier Bridge crossing the Saint Laurent River. Myself in front of the Saint Laurent. All up it was a lot of walking around the Old Town of Montreal, so it took us most of the morning. I was warned it would be a little cold this far north – by New Yorkers, at least – but the walking combined with the strong sun meant that we were pretty hot and sweaty towards the end of our sightseeing tour. We also visited a tiny free museum that we stumbled across that was all about the history of maple syrup – Canadians take that stuff very seriously. 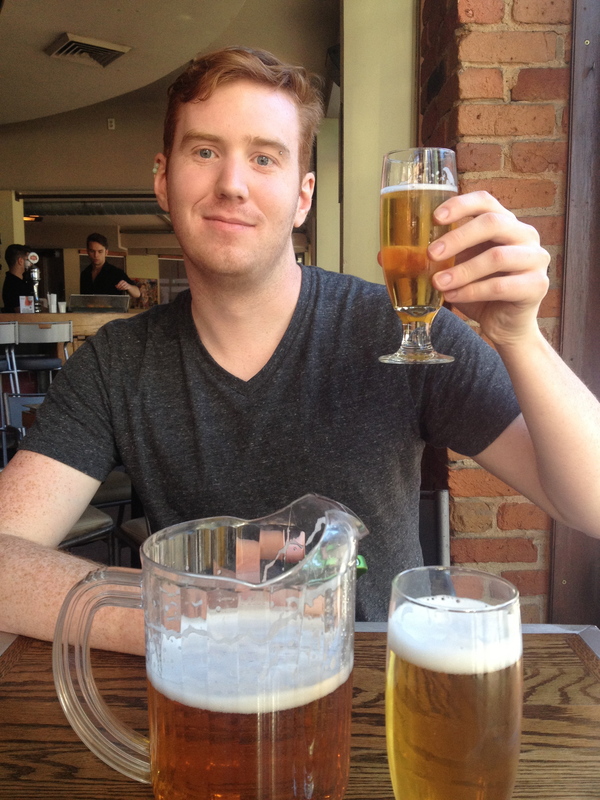 And of course, our stroll around Montreal would not have been complete without a final destination of the Montreal ‘Gay Village’ for what we believed to be some hard earned beers. 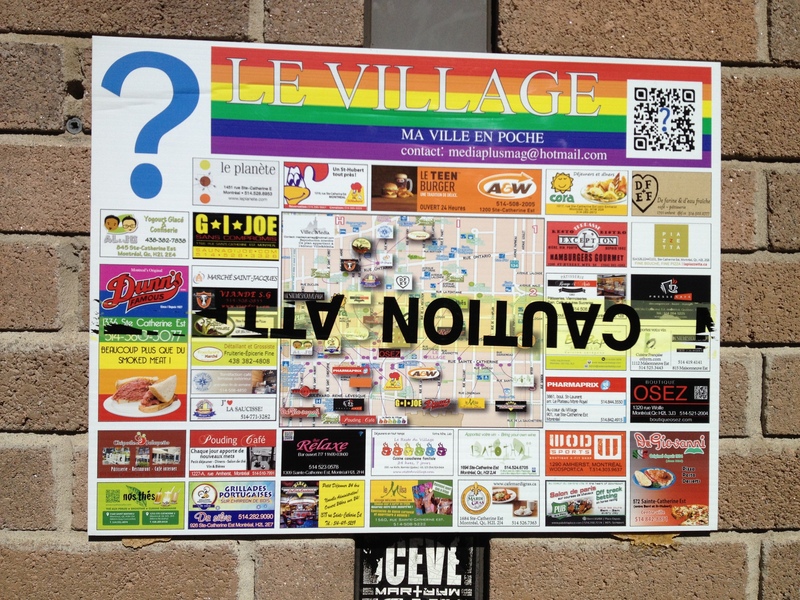 I thought it was just a cute nickname, but the gay area is literally called ‘The Village’. Stuart enjoying a beer after our morning of sightseeing.